Thankful the Singapore JazzFestival and all who were involved.There were some special moments for myself. Nick Zavior killing it. I should explain. While backstage I wanted to share story with Chaka Khan security was a little tight and only two people around her. I put a word in her managers ear that my Mother had met Chaka and took a picture. Well Nick started to sing and Chaka started nearing the stage and the few inched along behind her. She moved even closer to get an angle to see who this young man was singing. I thought that was a nice musical moment in time!! 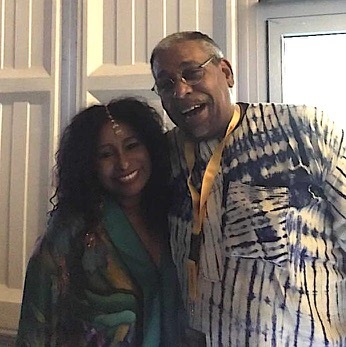 Afterwards ,I was able to speak with Chaka. I mentioned I was a bass player and she said I love bass players and chit chat a bit.Before my time runs out I better change the subject .I told her some years back she sang at a Family reunion my mom was at . She asked mom for a cigarette and talked while smoking. My mother told her " My son plays Bass and one of the great bass players in the world" She replied "oh yeah How is and where is he " My mother said ," He's in Singapore doing his thing " Chaka responded " So he's Safe" . When I told Chaka that it must have rung the bell because she immediately responded saying "He's Safe" while giving me a hi five '. So I was able to take picture with Great Chaka Khan as my Mother did when they met some years back . Yes thats special to me and will be to my mother since thats how it started . I waited a long time to meet the lady and share that . Things did come around ; I"m thankful and grateful!! !